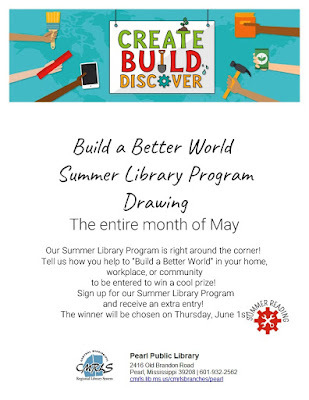 SLP 2017 NOT HERE YET, BUT YOU CAN STILL WIN AT THE PEARL PUBLIC LIBRARY! Summer Library Program 2017 for children, teens and adults, is right around the corner starting June 5, but Amy has a jump on things. The SLP theme is Build A Better World. For the whole month of May, come on in and tell us how to Build a Better World in your own environment and be entered to win one cool PRRIZE! Oh yeah! The winner will be chosen Thursday, June 1. Speaking of all things cool, Becky has the cutest Simply Crafts creation for Thursday, May 18 at 6 p.m. Little crafted critters. Hang them up or display them where ever you would like. 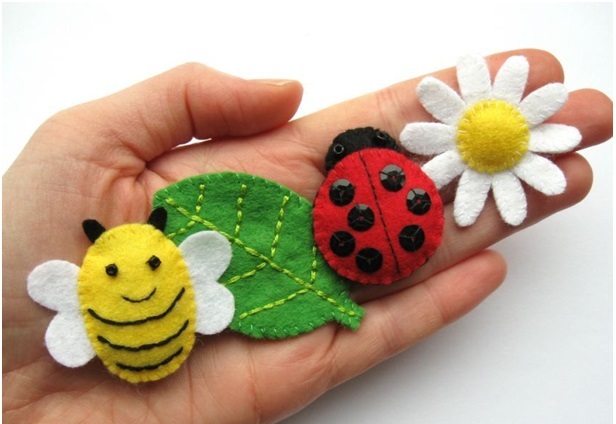 Remember Simply Crafts is every third Thursday at 6 p.m. No reservations need, and all materials supplied. And, it's FREE! The last thing you think of when you hear or see the word FREE is anything medical. Am I right? I'm right. This is what makes the highlight adult program of May a treasure. 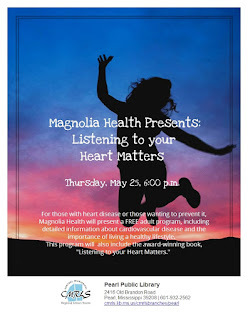 The Pearl Public Library is hosting a free heart health program, presented by Magnolia Health, a physician-driven, Mississippi-based, Medicaid Coordinated Care Organization (CCO), on Thursday, May 25 at 6 p.m.
Called “Listening to Your Healthy Heart Matters,” the program is designed to follow its namesake, the book entitled, Listening to Your Healthy Heart Matters, written by Michelle Bain, with Dr. Sharon Cresci. Participants will receive free copies of the program book. Martin and Robb visited the Pearl Public Library in 2016 for another relevant health program which was on Diabetes. BIG NEWS AT THE PEARL LIBRARY! THREE-DAY BIG BOOK SALE! 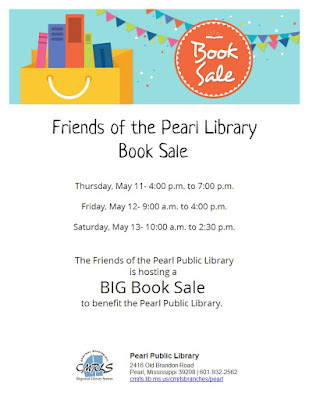 Have you heard that the Friends of the Pearl Library has expanded their annual (sometimes bi-annual) Big Book Sale to three days?! Yep. Three days! Thurs. 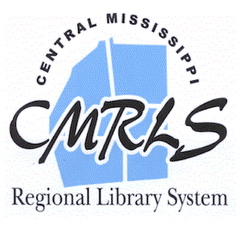 May 11 from 4 p.m .to 7 p.m., Fri. May 12 from 9 a.m.to 4 p.m. and Sat. May 13 from 10 a.m. to 2:30 p.m. Oh, yes! This is big news for the Pearl Public Library. Big! BIG!!! Many impressive items to choose from. A big item that people like to have in their home libraries is National Geographic Magazine. A nice supply is available in beautiful, maroon dated binders and on CD ROM. Get to the book sale as fast you can, these may be plentiful, but won’t last long! Interested shoppers will also have a fine selection of fiction and nonfiction books to choose from as well as DVDs and CDs (audiobooks and music – some classical). Book sale prices range from .25cents to $5.00. Please note that ONLY at the end of the last day of the book sale (Saturday) and not before, leftover items will be on a special, bag-for-a-buck, bargain. It’s everything you can fit into a grocery bag for $1. 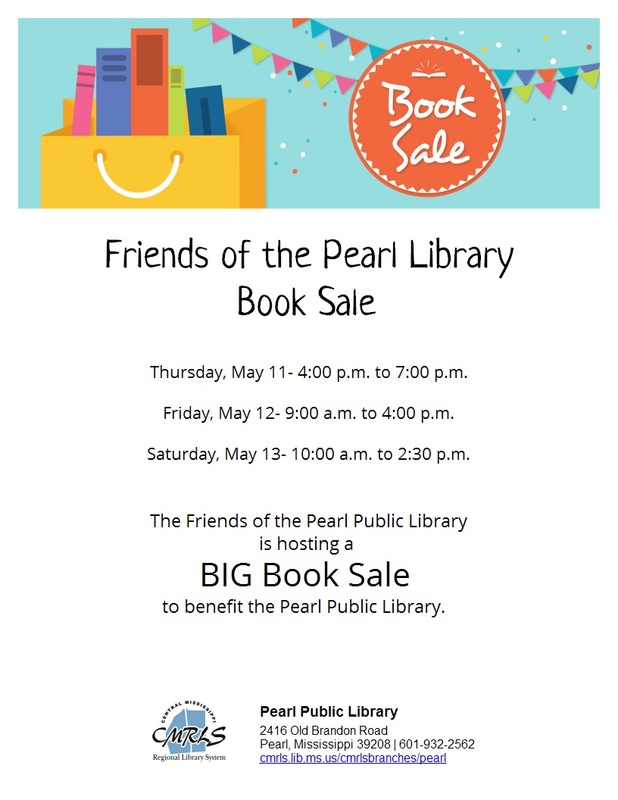 For anyone interested in becoming a member of the Friends of the Pearl Library, there will be registration forms available at the book sale. Individual membership is $5 a year. As always, donations to the Friends are also welcome. You do not want to miss out on this fun, great BIG BOOK SALE!